Shaenon: Random recent doodles for my old strip, Narbonic. I’m working on a TV/movie adaptation, though when or whether such a thing will happen is anyone’s guess. Channing: If this actually comes to pass, it will confirm that this is the best possible timeline. I mean, I would want the crystal behind me in my YouTube videos, too. I just realized that I have no mental image of what I think any of these characters’ voices sounds like. I keep thinking of Helen as having a Minnesotan accent, but I’m pretty sure it’s actually Dave who’s supposed to be from that area? Madblood reads like he’s affecting an upper class British accent. And yeah, Dave grew up in Minnesota. But then there’s the problem of him having smoked for ten years, and then suddenly having never smoked at all. Might have some effect on his voice. I envision Helen having something of a mixture of a number of different American dialects, due to moving around so much. Kind of how Audrey Hepburn had a combination Dutch/French/English accent because of where she spent her formative years. Mell strikes me (not literally, thank goodness) as having a contrived non-accent, particularly at school, but tries to sound all mafia when she’s feeling murder-y. I think that Helen Narbon Sr. (Mom) would sound like Meryl Streep if she had gone evil. Seriously, seriously evil. Or a mother-daughter pair who looked the same at the same age. They do exist. Like Zoe Perry and Laurie Metcalf. I don’t know whether to applaud enthusiastically or run screaming in terror. We can do both at the same time! 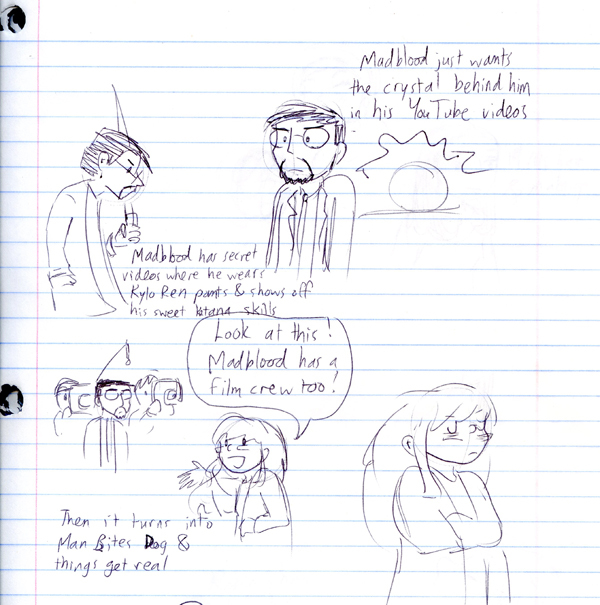 I’ll pay good money to get the “Madblood video shenanigans” storyline in whatever form it takes. if it was a TV sitcom adaptation and came with a laugh track, that would be Evil. I want a Narbonic TV series. I want it very, very much. I don’t think you can write a movie that’s a good adaption, though. Two hours isn’t really enough for Dave’s character arc – I think you’d lose a lot of it if you compressed it. You could do a movie that was just a ‘missing episode’ from halfway through, though, and that would, obviously, be awesome. Narbonic was the best webcomic. Well, trilogies are all the rage nowadays. We could have an initial film with Madblood as the villain, the Council of Daves and introduction of Lovelace in the second, and the third for the Dave twist and resolution. Narbonic: Madness & Genius: Part II (The Director’s Cut). I wish. Pitch it to Netflix. They’re doing alot these days. I always thought Narbonic would make a good radio series. It was always more about the dialogue that the visuals (which is not to say it didn’t have some good sight gags). Much easier to show a giant killer robot OF DOOM transforming into a crappy car, too. There’s a reason HHGTTG started out (and was always best) on the radio. Narbonic has a lot of visuals that I think would be difficult to convey as effectively via radio. As for H2G2, I have the book, the radio series, the TV miniseries, and the 2005 abomination of a movie remake. The radio series is very well-done, but overall, I really prefer the BBC TV miniseries. Narbonic was more about the dialogue than the visuals… in a sense. Shaenon’s characters have amazing body language; quite a lot of what they’re communicating isn’t through their words, but through how they move and how they stand. I think you’d lose a lot in radio. get a kickstarter for an animated narbonic and skin horse and I will pledge my life savings to it! Granted, that’s only about $100 right now, but still. I seem to recall making a comment years ago (or last year anyway) that a Narbonic television series would be the awesomest thing ever committed to film… or digital media, whatever. How about a kickstarter campaign? not for the whole, feature length film. Instead, just enough to create a few minutes.. proof of concept… kind of production. Be careful about that. It might succeed beyond all expectations. Which is why we have MST3K rebooted, and getting a second season on Netflix. I can’t decide between Narbonic: The Animated Series and Narbonic: Live Action TV — maybe you should do both just to be on the safe side?